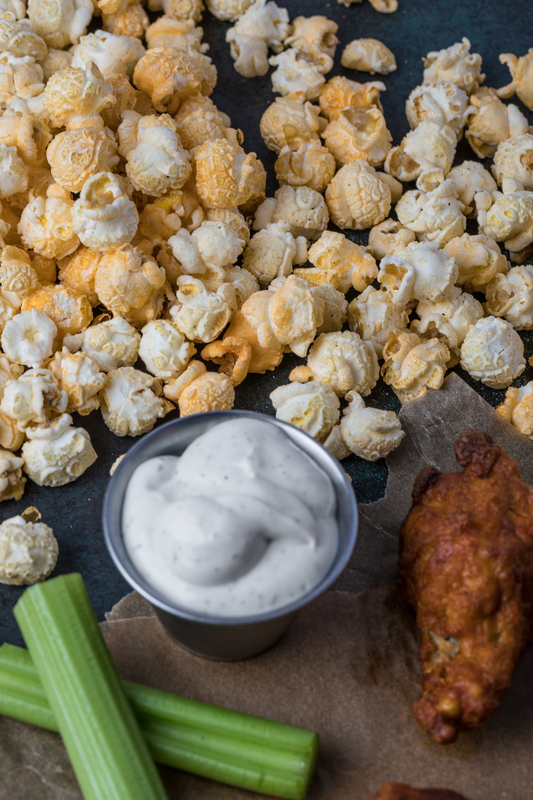 Bring on the buffalo wings and ranch dip! It’s Super Bowl time, and I’ve got a perfect touchdown recipe that you can make in just minutes for the big game. I’ve partnered with G.H. 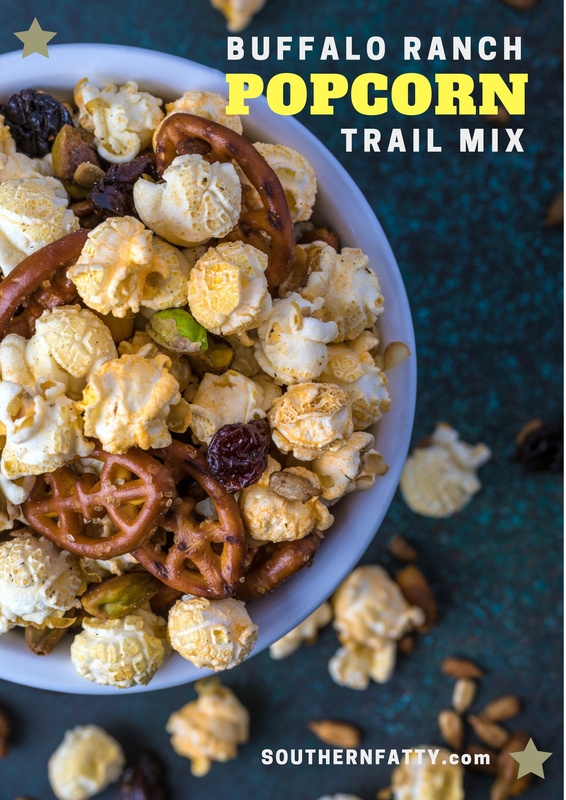 Cretors Popped Corn to blend their brand new Buffalo & Ranch Mix with some great grabbable bites to make a unique, kick-worthy trail mix that is a wonderful addition to the weekend plans. 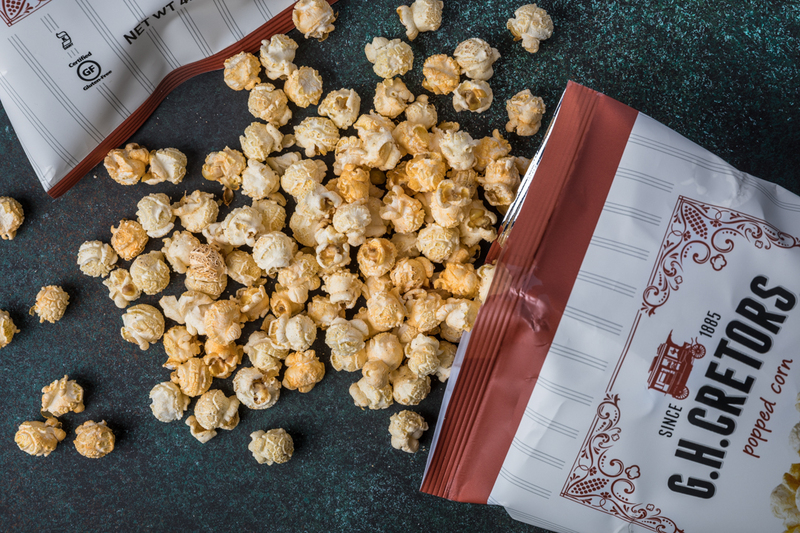 for this Buffalo Ranch Popcorn Trail Mix. Anyone that knows me will vouch that I am one of those ranch addicts. 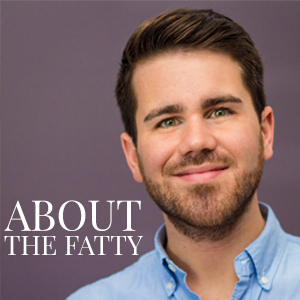 I was totally that kid putting ranch on pizza, dipping chicken nuggets in it, fries, the rare “special french fry” that my mom tricked me into eating (PS – it was squash, y’all…). Ranch on everything! — Not much has changed since then, except that I’ve swapped out those chicken nuggets for buffalo wings with a bit of a kick. G.H. 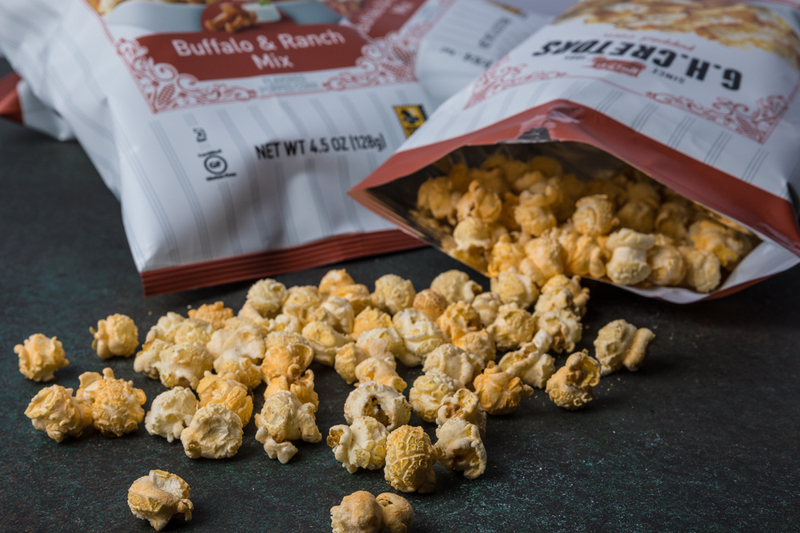 Cretors has created an absolutely magical combo for the latest in their line, Buffalo & Ranch Mix. I have no idea how they did it, but it tastes exactly like that you would expect from this double duo. You get that signature buffalo bam, cooled by the most amazing ranch puffs. If you follow along, you may have seen another Super Bowl post this week where I recommended the Cheese Lovers Mix. I first discovered G.H. Cretors by grabbing a bag of their popular The Mix. 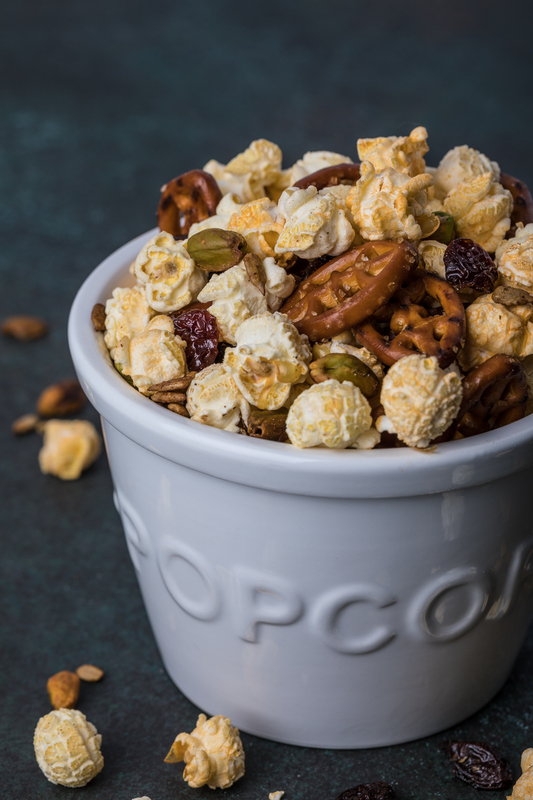 It’s a blend of caramel and cheddar popcorn. I’m not sure there are any words to describe it, to be honest. I keep a full bag at home, my friends have discovered where I constantly hide it, and I have started keeping some in my car for when traffic isn’t playing in my favor. Don’t judge me, y’all. All of the varieties are fantastic. 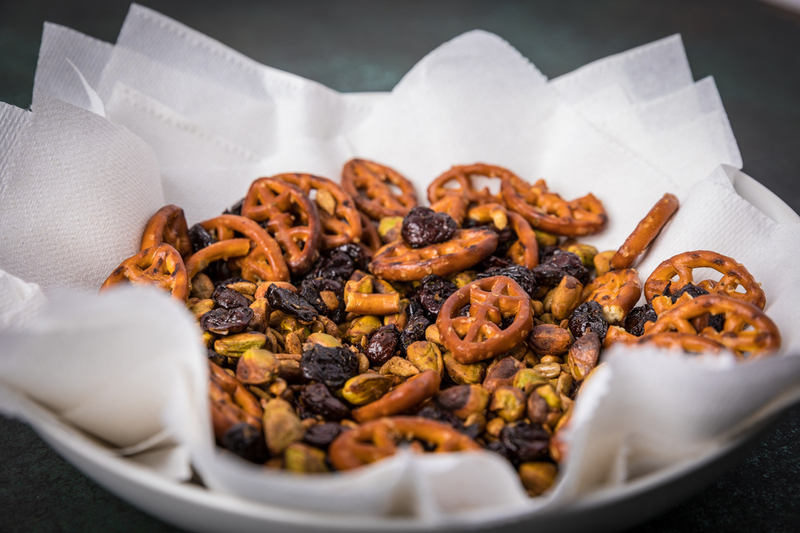 Trail mix is a perfect, laid-back party food that you could make ahead of time or just toss together last minute for something extra. 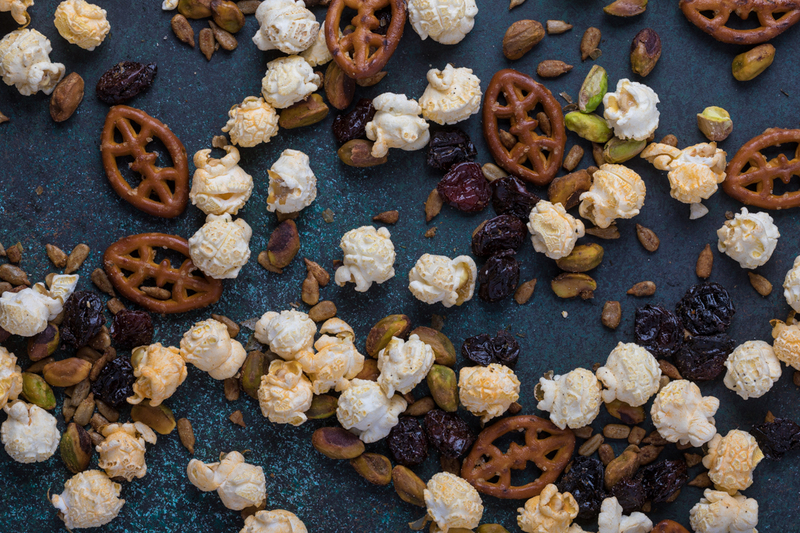 The mix in this recipe is a bit different than your typical snack. Pistachios, sunflower seeds, pretzels, some dried fruit, and the Buffalo & Ranch Mix popcorn as the MVP. 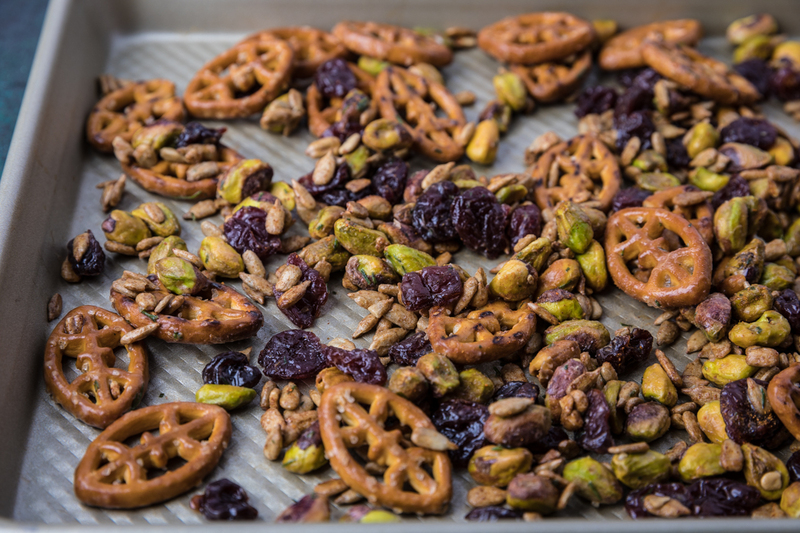 Tossed in a quick seasoned butter and baked, you end up with a savory snack to top all snacks. Who doesn’t want a bowl with 4 snacks in one grab? 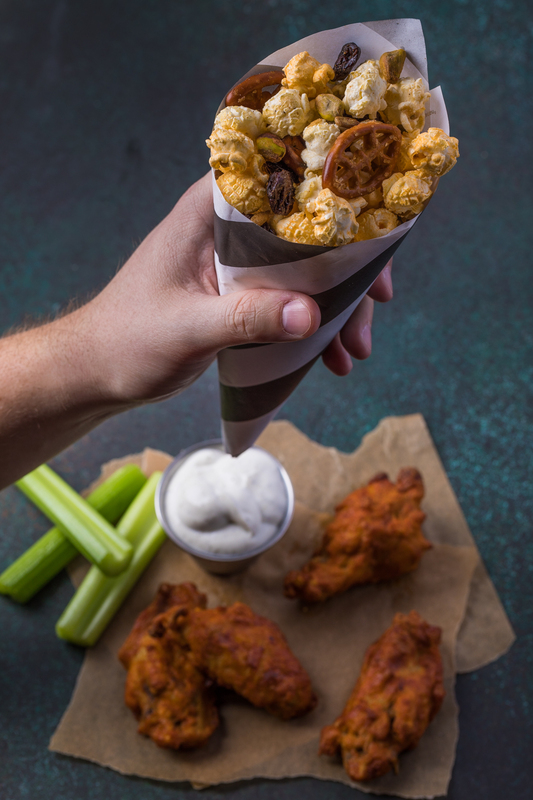 Obviously, this would work for any get-together, but for my Super Bowl party this weekend, I’ve wrapped up some paper referee sheets into cones so everyone can fill them up with the trail mix and mingle around without having to fight over everyone else’s hands. This is about as crafty as I get, and only for the sake of better snacking. 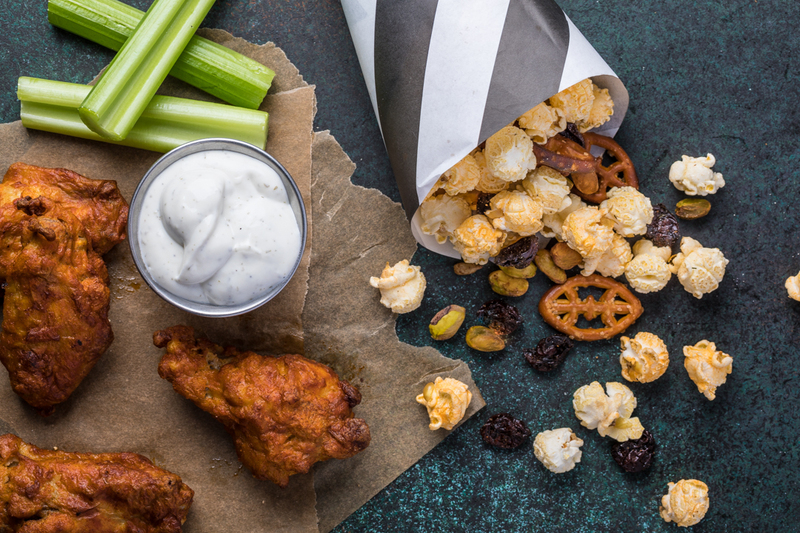 If you’re looking for some Super Bowl snack-spiration, or just a good excuse to stuff your own face with some delightful munchies, this is where it’s at. 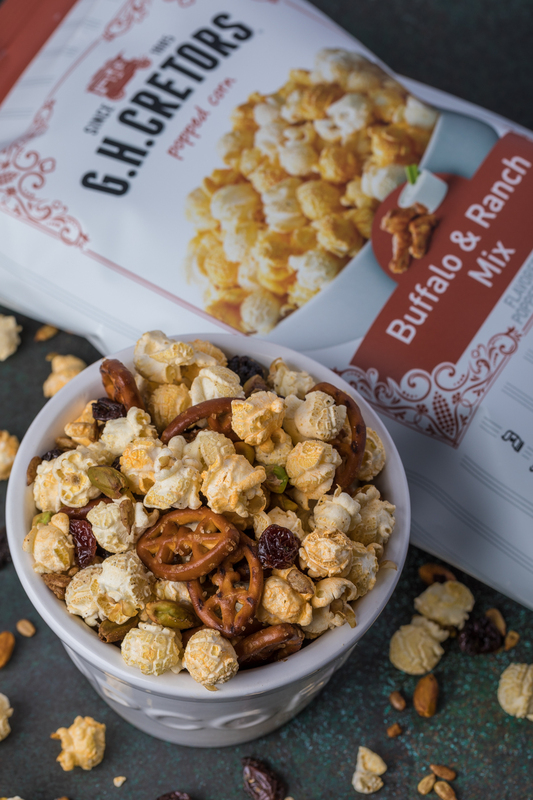 Buffalo Ranch Mix popcorn trail mix with baked, seasoned pistachios, dried cherries, sunflower seeds, and more. From SouthernFatty.com. Combine the glaze ingredients in a small bowl, mixing well. 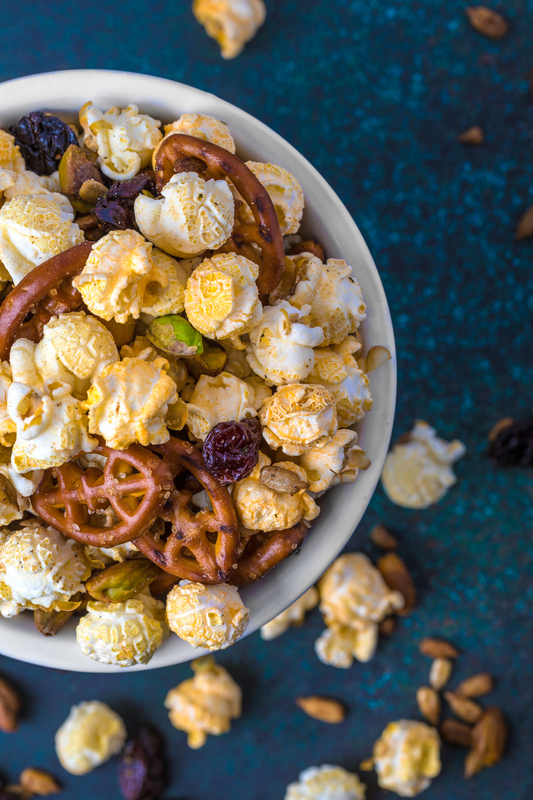 In a large bowl, combine all of the trail mix ingredients except for the popcorn. 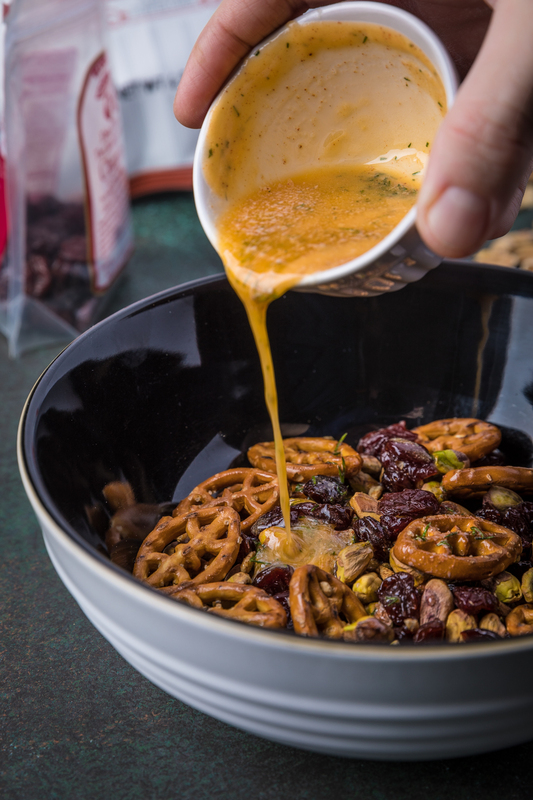 Pour butter over trail mix bowl. Mix well and transfer to baking sheet. Bake for 20 minutes. Remove and cool completely. 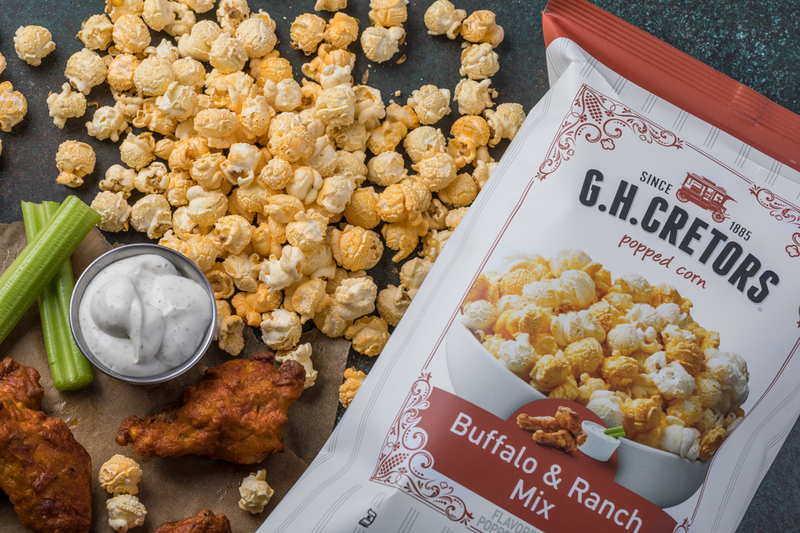 When completely cool, add Buffalo Ranch Mix popcorn. Serve to friends and enjoy! You can find G.H. Cretors products by using the product locator here. I definitely recommend grabbing one of each!